Today’s industry trends aren’t lost on Carter Schmidt. "Selling lemonade? You just don’t make much doing that; and, well, the newspaper boy may have disappeared," the eight-year-old tells me, a journalist, on the logistics of childhood employment. 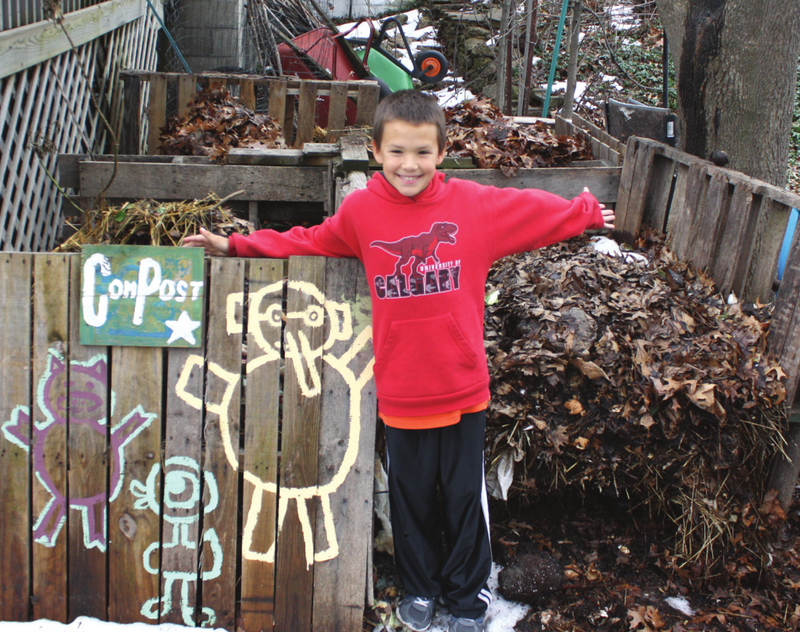 The third grader at Eastern Elementary School in Traverse City is an entrepreneur, having just completed the milestone of one year in business with his company, Carter’s Compost. 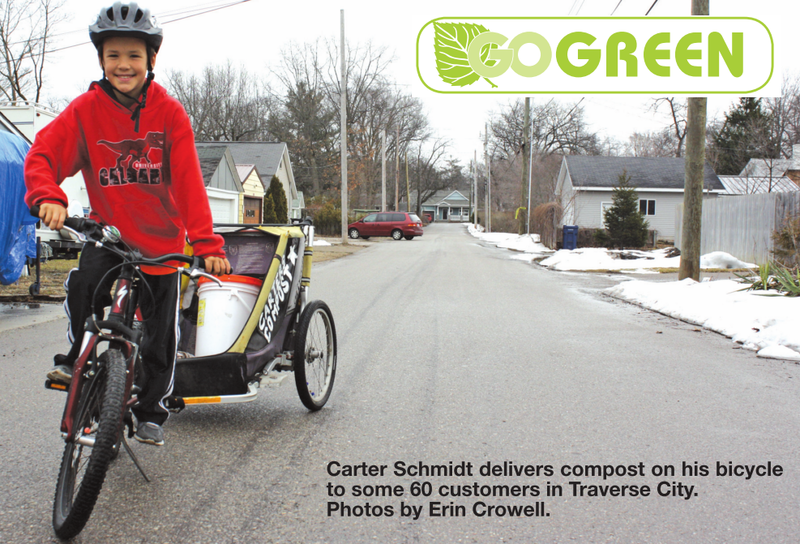 The bike-powered, kid-driven kitchen scrap pick-up service has been turning dirt since last April, charging its Traverse City neighborhood customers $5 a month for fresh compost. The U.S. Environmental Protection Agency would agree with him. "Food scraps and yard waste currently make up 20 to 30 percent of what we throw away, and should be composted instead. Making compost keeps these materials out of landfills where they take up space and release methane, a potent greenhouse gas," the agency reports. Everything from fruits, egg shells, tea bags, cardboard and coffee grounds can go from waste to wonder workers when combined with the correct amount of browns (dead leaves, branches); greens (yard clippings, vegetables); and water. For a complete list of materials to compost– and not compost–visit epa.gov/recycle/composting.html. Composting enriches soil, reduces the need for chemical fertilizers and encourages the production of beneficial bacteria. There’s a combination of both childhood and entrepreneurial enthusiasm with Schmidt, who pays his little brother, age six, to clean buckets. "I think, how on earth is that his favorite job? I like sifting the worms. Most people aren’t really worm likers, but I like to get dirty," he says. For every $5, Schmidt saves $3 with $1 going back into company investment (buckets, bikes, spray paint) and $1 to splurge – although instead of spending on video games and food, Schmidt usually ends up saving his Washingtons. Not only did Schmidt reach his unofficial quota of 50 customers, he currently serves 60 residents throughout the Boardman, Traverse Heights and Oak Park neighborhoods and beyond, riding his mountain bike with attached burly to pick up buckets of scraps that will be turned over and returned with fresh, rich soil. Dad, Ty, and a few friends also help cover ground, with pickups and drop-offs happening every Saturday and Sunday. Aside from hauling smelly buckets that weigh 15 to 20 pounds each (Schmidt’s mom, Johanna, estimated he’s hauled over 20 tons so far), one of his biggest hurdles is running a bike-powered business through the winter. "We call it mashed potatoes," he explains of the soft and slippery chunks of snow that form from traffic. But despite the weather, the long weekends and heavy hauls, Schmidt never complains about his job. Carter’s Compost is hosting Tour de Pile, a kid and family-friendly bike ride through neighborhood streets and alleys of Traverse City, on May 11. Participants will meet at F&M Park, at 1 p.m., and ride about four miles before wrapping up at Carter’s Compost Headquarters (located on Washington Street) with snacks, raffles and prizes. For more information, visit CartersCompost.com. There, you will also find sponsorship and volunteer opportunities, along with info on how to sign up.